On the day I wore this outfit, it was one of those in between weather days. I was able to go out with bare legs, but it was just not warm enough to have both bare legs and bare arms. So, I decided to wear my thin long cardigan. I really like this cardigan in summer. It’s very thin, so it’s not too warm for summer days, but it can give you just that tiny bit of extra warmth when you need it. Also, the length can really put an entire outfit together! At least, I feel like it totally makes this outfit! For the rest of the look, I went for a ton sur ton combo in blue! And don’t you just love this location?! We bumped into this super cute spot with rose bushes at both sides of the stairs. What do you think of this outfit? And do you like long cardigans? 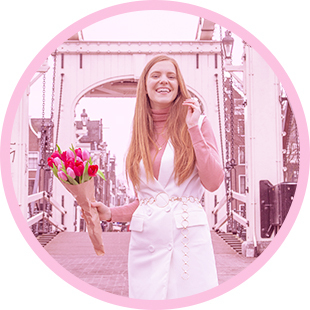 Mooie outfit & de foto’s zijn super leuk met die rozen erbij! Wat een geweldige jurk & hakken. Love it! Heeelll leuk! En de schoenen zijn super!